Flutter Social » Business FAQs » General » How does Flutter Social work for businesses? Flutter Social provides local engaged couples with on-demand personalized wedding pro recommendations based on 1) matches between what they're looking for and your business profile and 2) the personal/professional connections that you have in common on Flutter Social. Users can save you to their short list. Users can inquire with two clicks. They can add a personal message, or ust send our pre-populated note with their wedding details already included. Messages come straight to your Flutter Social inbox and your email. When a user marks your business as booked, we prioritize recommending businesses in the other categories that are in your network. Highest priority goes to your Preferred Partners (and your business is prioritized when your Preferred Partners are marked booked). Consumers can remove your business from their matches and let us know why it wasn't a fit to help us refine our matching algorithm. 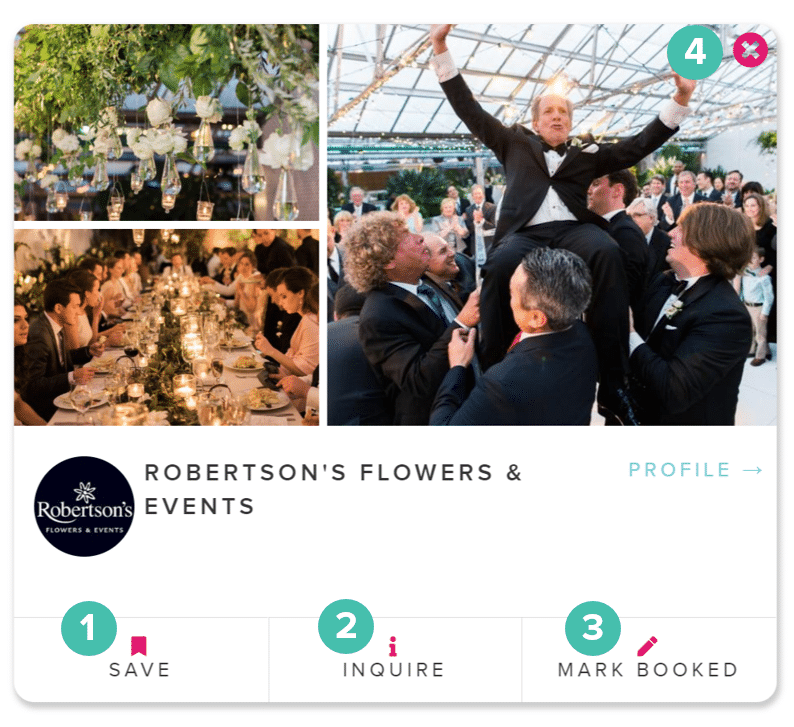 Flutter Social portfolios are a great way to showcase the most recent Real Wedding examples from your business during meetings with potential clients, and during brainstorming sessions with clients that you've already booked. A Real Wedding becomes part of the Flutter Social portfolio of all businesses tagged to that wedding. What does this mean for your business? If you're not a photographer, that means that when your network of photographers is on Flutter Social, we make it easy for you to get access to the content that showcases your businesses and services. Just ask your photographer friends to tag your business when they share the weddings you worked on together. If you are a photographer, that means more opportunities to get the right eyeballs on your work. Each collaborator you tag in the Real Weddings that you share represents another way for potential clients to find you since your work is also part of your collaborators' portfolios. Not only are your Preferred Partners listed on your Flutter Social profile (premium option), they also drive referrals to clients who are most likely to book your services. When a user tells us they booked one of your Preferred Partners, we'll prioritize recommending your business to that user if they are looking for pros in your service category. After all, the best things happen when you get to collaborate with the businesses you love. Inviting your current and past couples to mark you as booked.